So Fido's put on a few pounds recently? 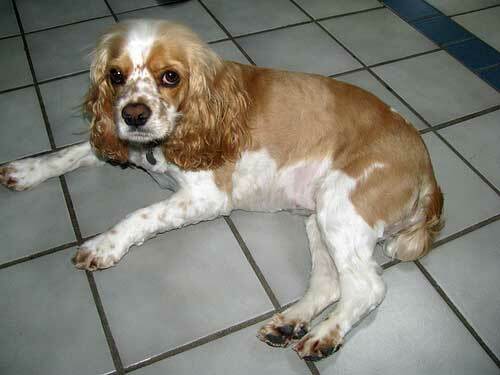 But did you know that overweight dogs are often less healthy than normal and prone to many diseases as a result? Learn what you can do to help your Cocker Spaniel lose those unwanted pounds and put a spring back into his step! Obese Dogs Are On The Increase - Literally! Overweight and obese dogs are becoming a fairly common sight, but that extra weight is having an impact on our pets' health. What Do You Mean..."Who Ate All The Pies"? But it doesn't stop there, excess weight will put pressure on their joints and bones causing pain and skeletal problems. Overweight dogs will find that any form of exercise taxes their energy; movement becomes uncomfortable and they're unable to run around and play or exercise like they used to. They become lethargic and sleep more, which only makes things worse because they won't be burning the calories they so dearly need to burn! Add to this the fact that they may also be in pain and it makes for a very grumpy dog - so watch out! An obese dog's quality of life will be considerably reduced, and to make matters worse, they're also more likely to die at a younger age - up to two years sooner than usual! Now you know the hard facts, let's see what we can do about it, shall we? Overweight Dogs: Who Ate All The Pies? 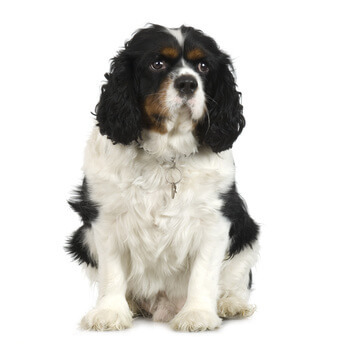 Just how overweight is your Spaniel? Do you know his ideal weight? Depending on who you ask it's somewhere between 12 and 16 kg (26.5 and 35 lbs) and whether the dog is male or female, how old he is and the state of his health. You won't ever find two Cockers the same so these weights should be used for guidance purposes only. If you'd like to learn more about how to work out the ideal weight for your Cocker Spaniel, just follow the link or ask your vet. Once you understand what he should weigh, it's time to find out if he's overweight or not and if he is, by how much? Pick him up and weigh yourselves together then deduct your weight from the reading. This will give you a pretty accurate indication of your dogs' weight. If you don't have a set of scales I'm sure your vet won't mind letting you use theirs. You can also work out whether your dog is overweight or not just by looking at him or by feeling for his ribs - if you can easily feel them, it's good news - he's not overweight! His ribs shouldn't be too prominent, (if they are, he may be underweight - which is just as dangerous for your dog's health as being overweight) nor should there be so much fat around your dog's middle that you can't feel them. Another way to tell is to look at his body when he's standing. He should taper in at the 'waist' (just below his rib cage); he should have a trim abdomen. If there's no shaping around the middle, it's likely your little (?) boy is overweight. Overweight dogs also tend to carry a little extra flesh (fat!) on their shoulders and hips. Check these areas on your dog - if he's overweight, they'll feel quite fleshy. And if you're still not sure whether or not you have an overweight dog, I recommend you visit your vet and ask for a weight check. They may even offer a free weekly clinic for overweight dogs, a bit like a doggie Weight Watchers! A realistic program of weight loss for dogs would be set to suit your pet and your vet may even recommend a suitable dog diet to help with his weight reduction. We love our dogs and it's tempting to show that love by giving them titbits from our plate at meal times or extra doggie treats during the day, but our pets already know we love them and if we keep on feeding them with fatty extras we're in danger of killing our dogs with kindness! The Association for Pet Obesity Prevention claims that 41.1 million dogs are classified as overweight or obese. It doesn't bear thinking about, does it? Are you feeding your Spaniel the correct amount? If you're not sure, take a look at the dog food ingredients label for details and feeding instructions. If his kibble is a complete meal (and it usually is) you can be confident that he's getting all the vitamins and nutrients he needs...so he won't need any extras! Split his food allowance into two portions and feed him morning and night. Use a measuring cup - that way you'll not be guessing how much food you're giving him. Feeding table scraps creates overweight dogs! Table scraps can really pile on the calories (leftover roast chicken complete with skin - come on, we've all done it!) and they add up surprisingly quickly. Hide the biscuits and dog treats - don't to tempted to give him treats or extra biscuits during the day - he doesn't need them! Why not give him a low fat treat instead, a small baton of carrot or apple. Max loves red pepper so when we're chopping veggies we save a few pieces and keep them in a plastic tub in the fridge to use as treats. If you're training your dog and rewarding him with food (as opposed to praise or his favorite toy) then you can substitute the usual biscuit treats for small pieces of chopped, skinless, chicken breast (it's very low in fat) or veggies, (fat free) or specially manufactured low fat dog treats. Don't forget to reduce his daily food allowance accordingly. Another way of rewarding your dog is to use his small kibble pieces, but again, don't forget to deduct the amount used from his daily food ration. Even better if his kibble is a low fat dog food. Make sure no-one else in the family (or friends and neighbors) are feeding your dog extras. Don't allow your pet to 'free feed'. Give him his allowance and if he's not eaten it within 15 minutes (as if?) pick his bowl up off the floor and put it away. You may find that by simply cutting the extras from your dog's diet, he begins to lose weight without having to resort to a special dog diet or tailored weight loss program. I recommend you keep a food diary for one week before you begin your Spaniel's weight loss program - you'll be surprised at just how much you give your pet each day! Unfortunately, because Spaniels are prone to obesity, particularly in later life when their metabolism begins to slow down, controlling the 'extras' may not be enough for him to lose the amount of weight he needs to and you may need to reduce his food intake to counteract this. Instead, you might like to try a lower calorie, low fat dog food, but just make sure you're not sacrificing too much protein for carbs otherwise your pet may actually put on weight. You'll be able to feed him less because the extra proteins (and not too many fats) will help to make him feel fuller for longer, and protein builds muscle. If you do decide to change your dog's diet, the usual caveats apply; do it gradually and don't forget to check it out with your vet first. In a nutshell, your dog needs to eat less and move more. Regular exercise is great for our pet's health and if managed properly it will help our overweight dogs to shed those pounds quickly. Begin to slowly increase his physical activity. Take him for a longer walk each day or split the walk into two, morning and evening. Walk at a quicker pace (no stops) to get his heart and lungs working and help burn off those calories. Reward him by letting him off leash for a while (if it’s safe) or play a ball game to encourage him to run. Once he's had some aerobic exercise, you can then take a gentle stroll home with lots of stop for sniffs and piddles. Exercise him twice each day and for at least 30 minutes each time, more if you (and he) can manage it, and don't forget regular play sessions in the yard or garden to help burn off a few extra calories! Important note: Cocker Spaniels can put on weight for reasons other than overfeeding. Obesity coupled with excess drinking, increased appetite, dry skin, a dull, lifeless coat, stiffness and lethargy, may be a sign of an under-active thyroid (hypothyroidism). If you notice any of these symptoms, take your Cocker Spaniel to see his vet who will offer correct diagnosis and treatment. Having your pet neutered often results in an overweight dog, but it's not the act of sterilizing that causes our pets to put on weight. Neutering reduces your dog's metabolism so you must take that into account. Your pet won't be able to burn off the calories he used to so he either needs to eat less or exercise more...or both! Neutered dogs need a maintenance diet because they no longer burn off as many calories. Many manufacturers produce a low calorie or 'light' kibble, but be sure to check they are actually lower in calories than his present food and that the protein levels are still high and carbohydrates reduced. Keep your Cocker's diet healthy; low fat, higher protein and less carbs (sounds a bit like the Atkin's diet, doesn't it?) and give him lots of exercise. Keep a watchful eye on your pet whilst he's on a diet. Some dogs may resort to eating their own poop when they're hungry - do regular poop patrols! An overweight dog that's exercised regularly (gently to begin with) and has lots of playtime chasing balls will soon burn off those excess calories! Monitor your pet's weight by weighing him once a week. If he's not lost any weight, check to see if he's managing to get to another food source, (scavenging, begging, etc.) or you can try reducing his food further (with caution) and increasing his exercise a little. Give him lots of cuddles and attention instead of treats; reward him with play and your love and before long you'll have your healthy, happy Spaniel back again. Don't expect results overnight, be patient and help him through this and remember, you could be adding another two years to his life!